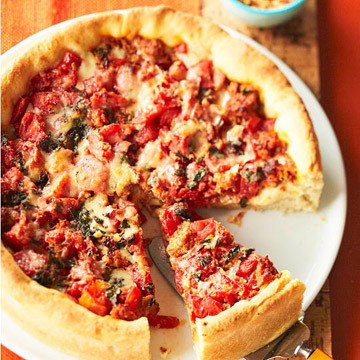 Illinois -- Bake this generous pizza in a pan at least 2 inches deep. Generously grease a heavy 10x2-inch round cake pan or 10-inch springform pan with olive oil or vegetable oil and set aside. For crust: In a large mixing bowl, dissolve yeast in the 1 cup warm water. Let stand for 5 minutes. Stir in 1 1/2 cups of the flour, the 1/3 cup vegetable oil, and salt. Beat with an electric mixer on low speed for 30 seconds, scraping the bowl constantly. Beat for 2 minutes on high speed, scraping the bowl frequently. Using a wooden spoon, stir in as much of the remaining flour as you can. Cover; let rise in a warm place until double (50 to 60 minutes). Punch down. Cover; let rest for 5 minutes. Turn dough into prepared pan. Using oiled hands, press and spread the dough evenly over bottom and 1 1/2 inches up the side of the pan. Cover; let rise in a warm place until nearly double (30 to 35 minutes). For meat filling: In a medium skillet, cook Italian sausage until meat is brown. Drain fat. Pat with paper towels to remove additional fat. To assemble: Arrange mozzarella cheese over dough. Spoon meat filling and tomatoes over cheese. Top with oregano and basil. Sprinkle with Parmesan cheese. Bake in a 500 degrees F oven for 20 to 25 minutes or until edges of crust are crisp and golden brown and the filling is hot. If you like, sprinkle the pizza with sliced mushrooms or chopped green pepper during the last few minutes of baking time. If necessary, cover with foil the last 10 minutes of baking to prevent overbrowning. Cool on a wire rack for 10 minutes. If using, remove side of springform pan. Cut into wedges. Hey, I like your site and I LOVE your recipes! I was wondering if I could substitute the italian sausage for grilled chicken fajita chicken instead? Thank you.